Guest rooms « La Masana » Bed & Breakfast welcome you the time of a pause which may extend, to ensure a comfortable stay. 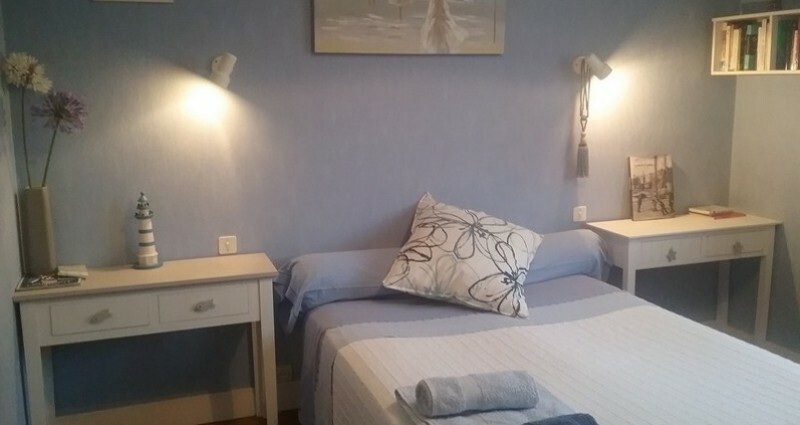 True Garden of Eden in the heart of Lorient, haven of peace located in a nice neighborhood, B & Bs « La Masana » are comfortable and open onto a walled flowery garden. For a stay for two, with family or friends, the Guest rooms « La Masana » welcome you for a stay made of conviviality, sharing and authenticity. Enhance your stay or your evening with the Moustoir Aquatic center with spa (5 minutes), the Cinéville cinema or your site offered at the Moustoir stadium for Ligue 1 matches. Whether you are planning a business or pleasure, for a short stay or for a trip of several days, the Bed & Breakfast « La Masana » are the right accommodation for you on your stopover in Lorient. Business trip in Lorient? A meeting, a seminar, a tradeshow, a business training course, a conference? Indulge in our guest rooms. « La Masana » becomes your ideal destination to relax after a day’s work. The Guest Rooms « La Masana » welcome business travellers to Lorient. For a quiet and studious evening, possibility of stopover, with a Table of Guests (on reservation). « Compagnie des Indes », « Tabarly », « L’Escale »: our guest rooms are spacious and comfortable, with generous breakfasts and homemade jams. Rooms « Compagnie des Indes » et « Tabarly » are very comfortable. Quiet, on the ground floor, these rooms overlook the garden. Both rooms form the Suite or family room for 4 people: 1 double, 2 single beds. Friends backpackers, families, business people on the road to Lorient, this Suite is for you. The blue room « L’escale » with its atmosphere « sea » is a lovely room on the 1st floor of the house, overlooking the garden, very pleasant, for 1 ou 2 people. The decoration in soft shades of white and blue creates a warm and calm atmosphere that invites to rest. Non-smoking rooms, the garden and the terrace are available. For hygiene and comfort of all our animal friends are not allowed in the rooms. 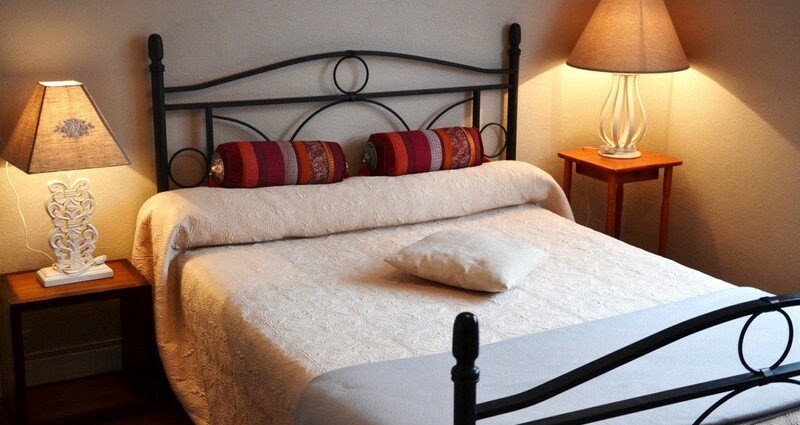 Near the city center of Lorient, away from noise and traffic, Bed and Breakfast « La Masana » offers its guest rooms whose names are an invitation to discovery. Quick and easy access to the « Pénétrante » (circular road) for the Expressway Axis Nantes-Brest. Friends hikers, bikers, you can avail of the garage to get your bikes safe. The Guest House « La Masana » Bed & Breakfast opens its doors for a quiet break in the heart of the city. Enjoy the tranquillity of a nice house, a warm welcome and quality services. « La Masana » Guest Rooms are located 3 minutes drive from the Convention Center of Lorient, 5 minutes walk from the City of Sailing Eric Tabarly and the Business Centre companies Keroman (The Base). 5 minutes from the DCNS, sailing courses and all outputs at sea. For a stay for two, with family or friends, the Bed & Breakfast « La Masana » welcomes you for a stay made of conviviality, sharing and authenticity. Volume discounts depending on the number of nights and season. Consult us. Visitor’s city tax is additional. Hosts table: 25€ (Starter, main course, dessert, beverage, coffee). Picnic baskets: 18€ (Assortment of Bretons specialities…) per pers. Presidential Tribune in Ligue 1 free! This large room « Twin » of 17 m² facing south, is located on the ground floor of the house. With a decoration on the theme of the sea, this room can can be suitable for 2 people with individual beds of 90 cm. For 3 and 4 people, twin room « Tabarly » is associated to the room in Suite « Compagnie des Indes ». Atmosphere « travels to India » for this double room of 13 m2, located on the ground floor of the house with access to the garden. Very elegant and tastefully decorated, the room welcomes you and impregnates you from the time of the East India Company. 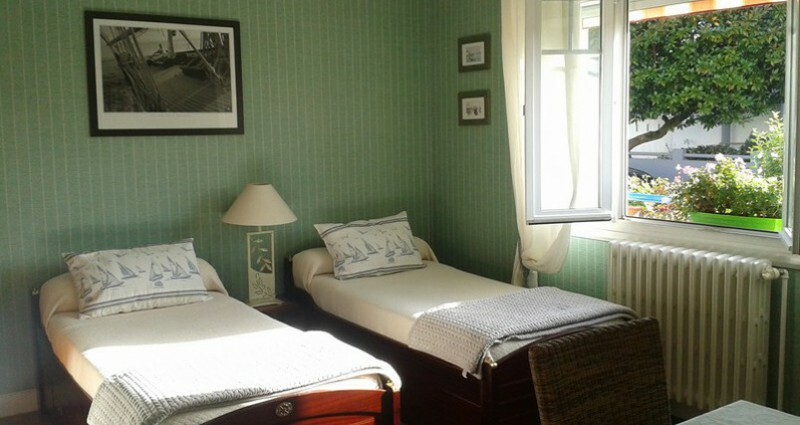 For 3 and 4 persons the double room India Company is associated in Suite room « Tabarly ». Atmosphere « seaside » for this nice room of 14 m2 for one or two people. The blue room is located at the 1st floor of the house, overlooking the garden, very nice and very quiet. The decor in soft shades of blue and white and the oak floors create a warm and tranquil atmosphere that invites to rest.